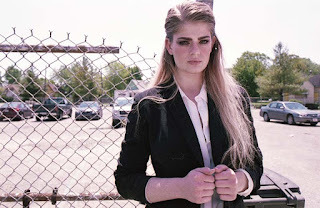 I did an editorial photoshoot for a fashion magazine recently. During the photoshoot I decided to shoot a roll of 35mm film with my Nikon N8008 (F-801 outside of the USA) mounted with a Nikkor 50mm f/1.2 lens between looks. BTW, the Nikkor 50mm f/1.2 is an awesome manual lens I got from my Dad’s estate, but is still made…and pricey. 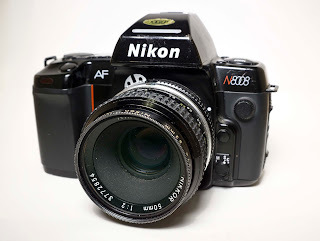 The Nikon N8008 is a cool camera that is super simple to use. It can be set from full manual all the way through full automatic. This is a perfect camera for beginners who want a film SLR and want full functionality. A benefit is that they can be found online for less than $50 with lens. On a Nikon film SLR timeline on Wikipedia under “Nikon SLR cameras” lists it as a late 80’s “high-end” camera. I shot the N8008 in manual mode, aperture priority and full automatic. In manual mode I set it just like I do my digital camera. I used an Elinchrom Skyport trigger and metered my studio lights to f/9 and the film 400 ASA. Next, I shot a few shots in full daylight in aperture priority and finally several shots outside in full automatic. Bottomline, all worked perfectly and the camera is easy to set & shoot. I didn’t use an automatic setting for this shoot, but I have previously and it works super. Oh yes, one other thing I did on this roll of Fujifilm Superia X-TRA 400, I developed it myself using a C-41 chemistry kit from the Film Photography Podcast store. This was my first developing attempt and I’m sure this impacted the quality of the images. Also my scanner isn’t quite up to contemporary standards…so there’s that. So if you want a solid film SLR that can be used in all modes and easy to use, then take a look at a Nikon N8008. A few shots from the shoot. Film cameras are a steal compared to what they used to cost! Lots of fun to shoot too. I've never tried color development. I did a bunch of B&W though, and I stopped doing it because of the time it takes to do it. I'd rather send it to a lab.